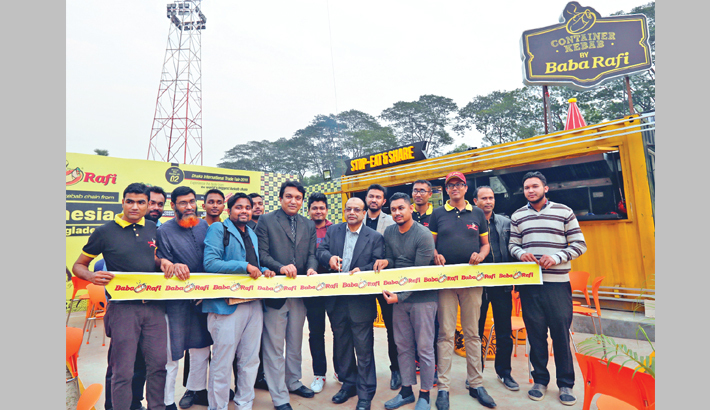 Bashundhara Group Deputy Managing Director Md Mustafizur Rahman inaugurates a stall of Baba Rafi at International Trade Fair at Agargaon in the capital on Monday. Indonesian food chain ‘Baba Rafi’ has opened a stall in the month-long Dhaka International Trade Fair (DITF), eying to offering delicious Kebabs of globally acclaimed food chain to the visitors. The country’s leading conglomerate Bashundhara Group introduced the international food chain in Bangladesh to satisfy the local food lovers with premium kebab delicacy. Deputy Managing Director of Bashundhara Group Mustafizur Rahman formally inaugurated the food outlet at a function at DITF in the city. Toufiq Hassan, General Manager Marketing, Bashundhara Group, Head of Operation, Baba Rafi, Nandan Kumar Debnath, Production Manager Arif Hassan Mahmud, and Ariful Islam Akhand, Assistant General Manager (Account and Finance), among others, were also present. 23rd edition of DITF, flagship event of Export Promotion Bureau (EPB), kicked off at city’s Sher-e-Bangla Nagar from Monday. The month-long trade fair will remain open from 10:00am to 10:00pm everyday.